Now this isn’t the case for every driver, of course, but a combination of our own complacency and the unpredictable behaviours of other drivers on the road, in addition to forces beyond our control, such as the weather (especially Canadian winter), make accidents essentially inevitable. 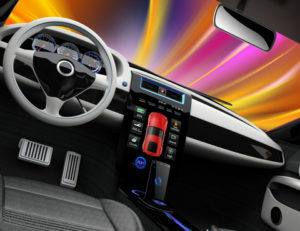 While technology has always been a major player in the automobile industry, it is only in recent years that the advancements being made have really enabled us to create products that are able to truly read and react to a driver’s environment. These gadgets perform a variety of tasks, some that compliment us and our responsibilities, as the driver, and some that legitimately replace the need for us to react all together. Combine these products with an alert and skilled driver and the amount of accidents that take place each day could easily be reduced drastically. So What Types of Gadgets Are We Talking? The most common safety related technologies currently available focus on three main categories: reactive and responsive features, automation, and warning systems. Adaptive Cruise Control – we all know and love our cruise control, but what if your cruise control could actually adjust your vehicles speed to keep safe following distances and even brake on it’s own to avoid collisions? Adaptive] cruise control systems can do just that. Automatic Headlights – visibility is crucial, especially while night driving or during less-than ideal weather conditions. Adaptive headlights are made to automatically adjust the level of light output, so you can keep your focus on the road. Back-Up Alarms/Cameras – blind spots are inevitable, especially when backing up a larger vehicle, such as a van or truck. In the worst case, there may be oncoming traffic, a pedestrian, or even an animal behind you that you are unable to see. Cue the back-up system – it will provide you with extra visibility and can even alert you if you are about to come in contact with something. Collision Warning Systems – a combination of radar, lasers, and sensors can detect when a collision is eminent (aka: it’s too late to avoid), and can prepare your vehicle for impact by means such as activating the brakes and even tightening the seat belts. Lane Departure Warning – whether it’s been a long day and you start to nod off or zone out, or you are trying to calm a screaming child in the backseat, swerving happens. With a lane departure warning system, an alert will sound if you begin to swerve from your lane, allowing you to correct the vehicles direction before anything worse can happen. While many new vehicles come with these features already installed, it is usually possible (and worth it) to add them as an upgrade if your current vehicle is not equipped with them already. Safety is always going to be a top priority in the automobile industry, and as such, technology is always going to be providing us with new and improved gadgets to help keep us as safe as possible. Remember though, these technologies are not excuses for us to not pay attention or to drive recklessly – it is still our responsibility to drive proactively, follow the rules of the road, and be attentive. Technology is amazing, but it can’t do everything. To find out more about helpful auto technology, contact us today at Freeway Auto Body.